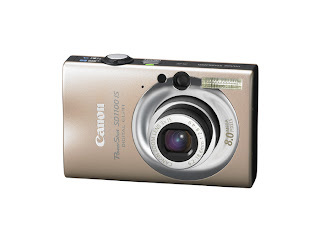 Looks like we have another stunning point and shoot camera from Canon, The Canon PowerShot SD1100 IS. The Canon Powershot SD1100 IS is available in five stunning colors, Rhythm and Blue, Bohemian Brown, Golden Tone, Pink Melody, and Swing Silver...Why Canon or any consumer electronics manufacturer feel the need to make their products' color sound like Lipstick or nail polish color is beyond me, it's not like guys buying the Canon PowerShot SD1100 IS will be using those color names specifically. The Canon PowerShot SD1100 IS features an 8 mega pixel resolution, 3x optical zoom and a 2.5 inch LCD screen. Other features of the Canon PowerShot SD1100 IS includes: face detection, optical image stabilization, and their proprietary DIGIC III imaging processor. The Canon PowerShot SD1100 IS will be available beginning March for $249.99.